Love is in the ... AIR! Please read entire post for all the dates, times, rules and details about this event. Below is our flyer with all the details for anyone who wants to come out and enjoy the show. Please feel free to save this image and the map below and post this to your social media or send out as an email to your friends, family and crew. This is the map for all spectators and anyone without a pass. You must pick up your parking passes on Friday night in order to park in the Fiesta on the Green and Sid Cutter lots Saturday morning. Handicapped parking is EXTREMELY limited so please only use it if you 1) have a handicapped placard and 2) you really need it. There will be raffles each day and a silent auction that will end partway through the Sunday brunch. Crew contest prizes will be awarded at the brunch as well as Crew of the Year and pilot prizes. Brunch tickets will be available all weekend and will be $5. 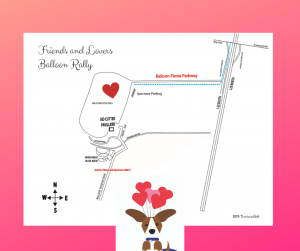 We are looking for 3 pilots to volunteer to do tethered flights on Saturday -- this is our largest spectator day and tethered flights are a HUGE draw for the event. If you would like to volunteer, please contact Charity. 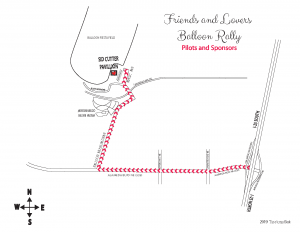 Below is the pilot and sponsor map. You must have a pass to park in this area. 6:45 am to 9:45 am: Let Event Staff know of intention to participate. between 5:00 PM - 7:30 PM. ● Baggies MUST NOT create a hazard when dropped from a balloon. ● Baggies must not weigh more than 4 oz. each. ● Baggies must have a tail between 2 & 4 feet in length. 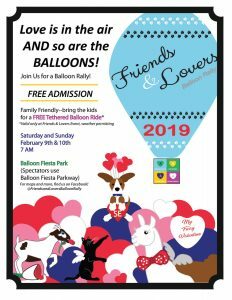 ● Baggies will be judged by our Balloon Meisterins and the winner will be announced during the Awards Ceremony & Brunch on Sunday, February 10, at the Sid Cutter Pavilion. ● Entries will be judged on appearance, creativity and conformity. ● Baggies will be available for pick up before Pilot Briefing on Saturday morning. The Crew Target and Creative Cheating will be combined this year. Crews must creatively find a way to get their baggie from the chase vehicle to the target, WITHOUT it touching the ground. The vehicle must not stop … it CAN move very, very slowly … and it MUST NOT leave the pavement. The most creative way of getting the baggie to the center of the target wins. Bribes will not be accepted … Get creative with your cheating instead!!!!! The baggies can be as big or as small as wanted as long as it is 4oz. or less. The 4oz weight limit includes everything, which includes the tail and all decorations. The tail can be decorated as long as all the necessary information is visible. We look forward to seeing your baggies!